Well I am currently doing some raw stuff in the build up towards the Welsh championships in April. For me the dates all sit really well with my planned comps for this year. So far it is the Welsh in April, Europeans in Romania in July. Then the Worlds in Soth Africa during October. Then I think that will be it for this year. Reflecting on the last comp and despite not having the best performance it was still a Win and as always a building block to work off. Really trying to focus at the moment on my basic strength and where I want to be at each point I compete this year. Whilst I don’t really do a yearly program I do have some ideas penciled in for each part. The Welsh is more than likely to be at 83kgs class well there is no real point in dieting for this one. However I don’t really want to be massively over the 74kg class limit, whilst being 80kgs in bodyweight feels good on times I figure it is not the best move for me. The Europeans this will be at 74kgs, lifting for the first time in Romania and amongst the vampires should be fun. It is always good to go to different countries and to see how they run their events. The Worlds again I will be 74kgs and it will be South Africa and that is a place I have not been for some years. Having been there a few times before I am sure it will be a different challenge for me with weather and starting to lift very early out there. Diet wise having help from Paleo Nutrition Wales on board is a big advantage in helping me eat quality cuts of meat and with my food prep. Again it seems funny that after all there years of lifting I am.now starting to change habits and realising the advantages of things like prepping meals in advance, it is definitely making life easier and with only having to figure out what I can prep in advance of the batch cooking times. 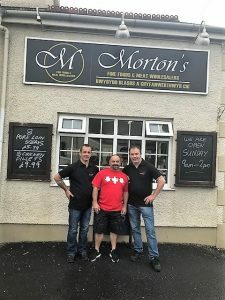 For this of you who buy food online you should check them out they have some great deals and I will say it is quality meat. So here we are at the start of another new year, I am a bit late updating the blog about my rundown from the year that has just gone. Fair to say it was an eventful year, whilst not going to Mongolia to defend my World title was a decision that was made quite early in the year. Then there was the Double European Titles, the full Power and the Bench only. Not too bad considering I was not on form with my benching during the last part of the year. Whilst not being able to do the British at the start of the year due to my son breaking his arm. Well these things happen I suppose however, it was good that he made a speedy recovery. I did do a Classic comp not too long after that and lifted at the 83’s and set some M1 classic records on the day. Then the Europeans I just scrapped in a squat on my last and that was enough to keep me ahead of the rivals. The Bench in October was a roller coaster also and whilst being down on the discipline it was about being there for the win, we played the numbers game and it give me my second European title of the year. So, what is the plan for the year ahead, well firstly I have the British Equipped In a few short weeks and there I hope to do something reasonable to secure selection for the forthcoming Internationals. So far it is only looking like sticking to the Full Power for this year, Whilst the Bench in Japan does sound appealing, it will be next time, I think. Time to bring the blog up to date, So due to a personnel issue I was unable to compete at the Arnold Classic in Barcelona. Unfortunately this things happen and as much as I wanted to compete it was not too be. 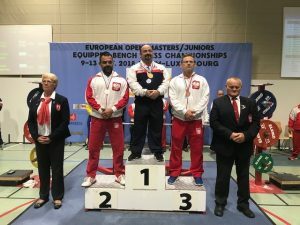 However 10 days after the Arnold I competed at the European Bench Press championships in Luxembourg. 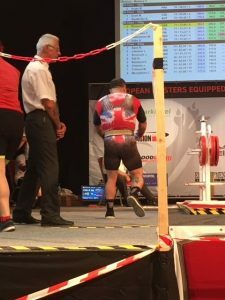 This was only my 2nd ever Bench only international the first was the World Masters in Ashington, England a few years ago where I placed 2nd in the 74Kg Class. So on to the lifting, on paper I was by far the biggest bencher in the class, during the warm up it was evident the bencher in me was not firing on all cylinders. Under the guidance of my coaching staff Marc G and Dean B the decision was made to drop the weight down on my posted opener. The first attempt went as expected and put me first on the board of lifters. The a stupid mistake on the second and a fail. After posting my third we had to play the numbers game to make sure I went last and was there for the win. So now with some rest time before the next comp it will be time to get back to full fitness and focused towards the British Equipped next January at Horncastle. It has been some time since I updated the blog so here we are 3 weeks away from the Arnold classic. So, what’s been happening then? Well I think the training program has had to change a little bit and I feel that sometimes that must be done. There will times when even the best laid out plans need to be looked at and adjusted. So right now, the basics are I am up to just under 85% of my max weights with lower weight rep range as I would normally be at this point. I have not used any off my comp kit yet in training, but I am sure that will change now in the next few weeks. I do want to do my last few sessions in full kit and to make sure my lifts are comp quality. After all I don’t want to get knocked back for silly mistakes like what happened at the European master’s earlier on this year. 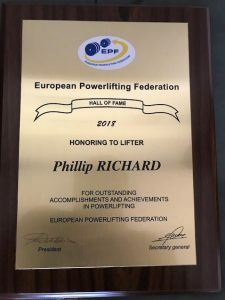 The Bench I opened on 200Kgs and then jumped to 207.5Kgs for another comfortable lift and that weight was picked to win the European Bench off between myself and Phil Frost. 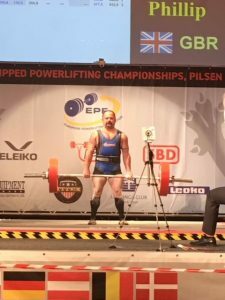 I then jumped to 220.5Kgs for another shot at the European record, coming quite close it was just lost at the top and despite not making it I felt it was a good try. My second was enough to gain the Gold on the Bench also. The deadlift came, and I was really starting to feel depleted. 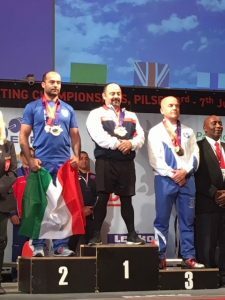 My opener on 230Kgs was enough to secure the win and then a 242.5Kgs second gave me the Bronze in the deadlifts I did try 250Kgs, but it was not there and no where near on the day. So, as I said the overall outcome was a win and with my poorest performance to date. Also placing 3rd in the Best lifters award. So here is some great news for me to share with you guys. I have been fortunate to have picked up a new sponsor. The Guys at Paleo Nutrition Wales have started to help me with another aspect off my training. This time it is diet and they are going to make sure they fuel me up with their top-quality meat. So, for any of you who use the online way to purchase meat please check them out, you won’t be disappointed at the quality off all their cuts off meat. Having these guys on board will definitely make it easier to get my diet spot on and with the quality they provide I know I am eating top quality meat.